The naming of the town. Featherstone Make a Difference Forum > Forum > Featherstone History > Town History > The naming of the town. I wondered if anyone knows how Featherstone and Purston Jaglin got their respective names. Pontefract was named by the Romans because of the broken bridge down near the Cobblers pub and is Latin for fractured bridge 'pont' meaning bridge and 'fract' meaning fractured. Would be interesting to find the origins of the names. Re: The naming of the town. Interesting. I wonder if Featherstone and Purstone are linked because of this. Take the stone off each one and you have Feather and Pur. If Feath means three, I wonder what Pur means? I think the ton part of it meens, farmstead. when i was at school i can remember quite clearly Wilfred Pickles broadcasting a programme about Featherstone on the wireless (no tv,s themdays) and he said the name Featherstone came about was.A king on his travels died on the spot where North Featherstone church is ,and where buried him they covered his grave with four stones hense Featherstone. I wonder if the B.B.C. still have this recording in their archives. 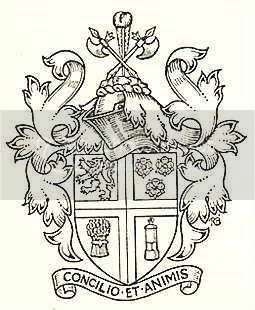 Armorial bearings were granted to Featherstone urban district council on 23rd of February 1955. Their design was suggested by the clerk to the council Mr. H Tattersall. The purple lion on gold in the first quarter was the coat of arms of the De Lacy family, lords of the manor of Old Featherstone; white roses on blue indicate that Featherstone is in Yorkshire; while the sheaf of corn and the miners lamp have reference to the principle industries of the district, agriculture and coal mining. An ostrich feather and a rock (feather-stone) indicate the name of the district. The two battle axes are a reminder that battles were fought in the locality during the civil war of 1642-49.
another extract from Jims research. those who understand will realise the years that have been spent putting this together. all Jims work is by copy right. There appear to be only three Featherstone’s in Britain. In addition to the above there are at least 2 similarly named places. Featherstone a district in the North Island, New Zealand. In matters of antiquity the places overseas can be ignored, but it is certain that directly or indirectly, if named after some settler, they owe their designation to one of the English Featherstone’s. Featherstone. What does the word mean? How was it derived? In any study of place names it is essential to examine the various forms of the words used at different periods, and to see how the modern spellings have developed. The following list of various spellings of Featherstone, (Yorkshire West Riding), no doubt incomplete, is given with the date and source from which they were obtained. Other names to be found which refer to Featherstone are Fodorstan and Featherstaine but like some of the other names are probably due to faulty spelling and never the usual form at all. FEATHERSTAN is very common being found also in the Kirkby’s Inquest, The Yorkshire Deodands for 1324-1325, The Cartulary of Nostel Priory, The Pipe Rolls, Rotuli Chartorum, Pontefract Chartulary, The Registers of the Archbishop of York, Feudal Aids London 1899/1920, and the Yorkshire Feet of Fines. FETHERSTON is still more common from the beginning of the 14th century. It can be found in the 1478 records “of the Cellarer” of the monastery of Saint Oswald at Nostel, in the West Riding Sessions Rolls, on tombstones in the Parish church, and in the Parish registers. Conclusions as to the meaning of the place names are not always satisfactory and there often seems to be a certain amount of speculation as to what the names really mean. There are many books on the subject. The following are a selection from those that have been consulted, four of which give the same meaning of the word Featherstone. Anciently Fetherston, Fredaston, that is Fredas town, from “Feade” or “Freda” a common Danish appellation. A general of that name is mentioned serving under Hardicanute about 1042. The Domesday Book spelling Fredestan is probably a “metathesised” form of Fredrestan which appears as Fedrestana in an early entry in the Pontefract Chartulary, and as Fetherstan in the Pipe Roll. The first element is clearly a personal name, and this may well have been (old English) Feader, which appears as the name of a house-Carl of Hardicanute who was killed at Worcester in 1041. This is identical, or cognate with the Old Danish Fathir, which appears in the Danish place names, Fatherstorp, and Fadestrup. The termination is the Old English stan,…. a stone. Goodall agrees in this book that the termination is from the Old English stan…a stone and not the Old English tun…. a farmstead and that Fether of Feather need not be a personal name. He thinks that there is a possibility that the first element is Celtic and means woodland but states quite plainly that the meaning is uncertain. Could the meaning therefore be …. Stone in the Woodland…. Or Woodland Stone? Place Names of England and Wales. Johnston. Published 1914 by John Murray. Although not completely happy with this interpretation he feels that no better answer has been offird and believes that Featherstone means “four stones”. Here again we find agreement as to the termination Old English stan…. a stone, but we have a slightly different explanation for the first element. The Old English fether means four. Thus Fetherstan signifies four stones. A tetralith, or cromlech, which consists of four stones, three upright ones with a headstone.. Suggesting the meaning is “Four Stones”. FEATHERSTONE West Riding of Yorks. Tetralith (four stones). Brief but to the point, again suggesting the same. The final “e” to the name began to appear in the 17th century, but the vowel “a” does not seem to have been inserted, and then not generally as tombstones show, until the 18th century. While there seems to be justification for writing “stone” there seems to be none what so ever for “feather” and it would be extremely interesting to know exactly when and how this practice arose. Purston and Puston Jaglin are later changes to the early name. In the Featherstone Parish registers we find both Purston and Preston from early in the 17th century. Preston is a very common English place-name and means the “priests enclosure”. In Old English; preost…..is a priest and tun…..an enclosure or homestead. The name is obviously derived from the Old English preost..tun, so there must have been a priest in the village prior to the Norman Conquest. There is no documentary evidence to support this although it is known that the Anglo-saxons mapped out England in parishes each with an endowed priest and a place of worship. The thegn or local magistrate gave the land or the endowment. Initially the priest was the private Chaplin attached to the thegns hall but in the course of time later priests became the parson of the parish. It is possible that a priest was attached to the local magnate in Purston. The local priest may have taken up duties in the chapel in Purston founded there by Robert De Preston early in the 12th century. William De Preston his son endowed a chantry in the chapel about 1160. The additional word, perhaps the name of a local man, may have been added to make it distinctive from other Prestons in the area. When the name was first noted in the 14th century there was a land owner amongst the local poll tax payers whose name was Thomas De Jacklyn. It is possible that there was a Jacklyn who lived at the Preston from whom the name arose. The name however does not show in the Preston Jakelyn poll tax return. As Preston became a natural variation of preost tun it is possible that Purston became a variant of Preston, and Jaglin one of Jakelyn, perhaps by mi-spelling. The variant Jaglin adds distinction to the name and it is a pity that the full name Purston Jaglin is rarely used now. Is it through laziness or merely a lack of knowledge? Does any one know if there was ever a coat of arms or other symbol connected to Purston Jaglin,as it was a seperate Village from Featherstone at one time? Our great England looks set for deeper and deeper reduced input that has the cheek to ask us to start helping with local services etc. Anything to move Featherstone forward apart from housing is well out of the window it seems unless we do it ourselves. Regardless of the political fight in Featherstone, the last 8 years have been a pleasure at times to be able to absorb the wealth of historical knowledge of our small but great town, because of what the fight brings to light. Anyone fancy a winter research project? There have been many people over the last 10s of years and recently on forums such as this that have offered up clues to a magical part of our local history called the “four stones” or as we know the start of the word “Featherstone”. Perhaps the minds and people with shovels that exist and hold the passion could pull together and find these stones. For to long there has been talk. If the stones could be found they would make a great tourist attraction incorporated in the new Lidle art work? If the stones could be found would it not be a great tourist attraction if they were placed as originally laid at the four corners of Featherstone? If they cannot be found would it not be a great asset to the town to re-create them. The last known whereabouts of the stones is on the Wakefield road allotments. Where to begin? Perhaps an agreed description of what to look for is a starting point?